Republican Gov. Rick Scott, now running for the U.S. Senate against the Democratic incumbent, Bill Nelson, nickeled, dimed, slashed and ignored Florida’s environmental protections for almost eight years. Florida Gov. Rick Scott has declared a state of emergency over an environmental disaster that he insists has nothing to do with him. It’s true that red tide — an evil-smelling algae bloom now fouling the precious beaches along Florida’s southwestern coast — is an oft-repeated natural phenomenon. Thousands of dead tarpons, manatees, sea turtles and other large creatures floating offshore and onto beaches, though a jarring sight, has happened before. But red tide this year, it’s crazy. And so are the other algae, the freshwater blue-green slime blooming every summer in Lake Okeechobee. This year, the toxic algae have been sent coursing through Florida’s estuaries to both coasts. 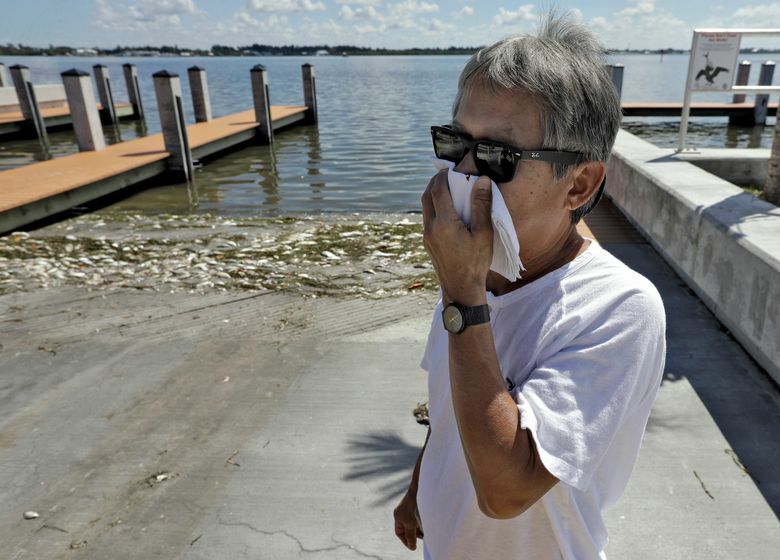 On the Treasure Coast, for example, people who’ve made “contact” with the St. Lucie River have been going to emergency rooms, complaining of nausea and shortness of breath. Florida’s environment is fragile. Recognizing the enormous importance of natural beauty to the state’s economy, governors — both Republican and Democratic — have at least attempted to address the ecological threats. Not Scott. And now they can use their hard-earned money to bail out their failing restaurants, fishing boats and other tourism-related businesses now bereft of customers. They can spend it on breathing masks and beach vacations in New England. I’m not sure how lower taxes fit into selling real estate during a biblical-sized plague attacking every one of the five senses, but they might help. What else did Scott do? He cut his budget requests for the Florida Department of Environmental Protection year after year. He repealed a law requiring septic-tank inspections, important for reducing water pollution. He rolled back other regulations and decimated the environmental enforcement staff. Scott couldn’t just budget $50 million for conservation programs in the normal way. He insisted on selling state lands to raise the money. This was one of the few things he couldn’t get away with because it was so controversial. Heavy rains this year have forced more of the freshwater algae to be flushed from Lake Okeechobee into the estuaries. Fertilizer pollution from sugar farms, citrus groves and ranches feeds the algae. When there is conflict over this, Scott habitually sides with the biggest polluters. The sugar industry has quite a deal. It enjoys enormous subsidies, courtesy of federal taxpayers and price supports. Then it gets to dump the waste onto the bottom half of Florida. We haven’t even gotten into global warming. The higher temperatures fueling catastrophic fires in the West have been causing massive flooding in much of coastal Florida. As for the algae crisis, “climate change will severely affect our ability to control blooms, and in some cases could make it near impossible,” according to scientists at the University of Florida and the University of North Carolina. Scott refuses to concede that human activity contributes to warming, but you could have guessed that. Scott is now running for the U.S. Senate against the Democratic incumbent, Bill Nelson. Predictably, Scott is blaming Nelson for the environmental disaster. Nice try. Nelson is one senator in Washington. As governor, Scott had the power to enforce the Clean Water Act. As governor, Scott nickeled, dimed, slashed and ignored Florida’s environmental protections for almost eight years. Get this: With an election now upon him, he’s suddenly demanding more money for the state Department of Environmental Protection. This is a politician who knows he’s guilty of environmental malpractice, and so should the voters.